Learn a new hobby, improve your job skills or start a new career! SCC Corporate & Community Education can help. We offer a variety of classroom and online classes. Take a look at our upcoming classes featured in the October 2013 Newsletter. You may also view a complete listing of classes on our course webpage. We are getting some rave reviews from our Cake Decorating Classes! Join us for our next class, Cake Decorating Basics, beginning on October 21. Learn the basic techniques and tips for creating beautiful cakes for family, friends and special occasions. In this class you will learn how to decorate a great cake with icing drop flowers, rosettes, shells and much more! Tuition is only $69 and supplies are approximately $40. Remember – what you learn can be priceless! With fall classes underway at the new Evans Academic Center at the SCC Downtown Campus, the College is celebrating its grand opening with two events this month – a formal Grand Opening Celebration and a free community drop-in. The entire community is invited to see the restorations of this historic landmark and the renovated classrooms and labs that will provide a state-of-the-art educational experience and training for thousands of future students. The Grand Opening Celebration on Wednesday, October 23, from 6:30pm until midnight, will be an evening of fine food, live music and dancing, a brief College presentation, and self-guided tours of the Evans Academic Center. College mementoes honoring SCC’s 50th Anniversary will also be available for purchase. Tickets are $75 per person and can be purchased at www.sccsc.edu/celebrate until October 14. On Sunday, October 27, the community is invited to drop-in from 2 to 4p.m. for light refreshments and tours of the building. Visitors will also have the opportunity to meet staff members and learn more about campus offerings. Admission is free. “We welcome community residents into this beautiful, historic building so they can see first-hand the results of our partnerships, and the exciting educational, training opportunities that await students,” said Judy Sieg, SCC executive director. 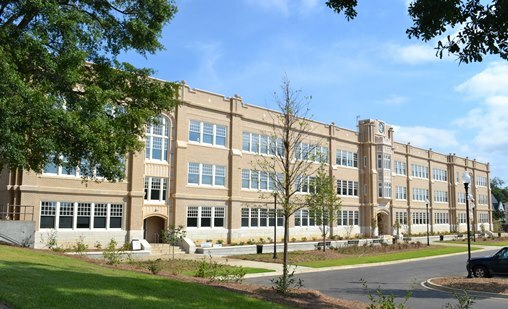 Originally known as the Evans Building, this historic 1920’s structure served as the center of Spartanburg’s educational system for more than 50 years as the Frank Evans High School, Spartanburg High School and Evans Junior High School, before being acquired by Spartanburg County. SCC announced the purchase of the 104,000 square foot building in 2009 with plans to provide education and workforce training to local residents and serve as a catalyst for increased economic development in downtown Spartanburg. SCC’s restoration and LEED Silver certified renovations have placed the Evans Academic Center on the National Register of Historic Sites. With over 363,000 square feet of multi-use warehouse and office space, the Center for Business and Entrepreneurial Development (“Center”), located at the Spartanburg Community College (SCC) Tyger River Campus in Duncan, is the fourth largest business incubator in the United States. Serving small to large companies through a variety of specialized programs, the Center has become a model of success for attracting and launching technology and manufacturing related businesses, as well as increasing economic development and employment in Spartanburg County. The largest business incubator facility in the nation is the Batavia Industrial Center in New York with 950,000 square feet, followed by the BioSquare in Boston with 700,000 square feet and then the Fulton-Carroll Center in Chicago, housing 400,000 square feet of space. According to National Business Incubation Association Publications’ 2012 State of the Business Incubation Industry, large incubators like these are the exception rather than the norm, with only eight percent of all incubation programs reporting to have facilities larger than 100,000 square feet. However, business incubator programs are on the rise with approximately 1,400 in operation in North America in 2012, compared to 1,100 in 2006. SCC’s Center offers start-ups and established companies assistance in four key areas: incubator services, soft landings, workforce employment services and special projects. Participating companies can utilize the Center’s services or space for up to a year at no cost, other than utilities, if they agree to establish a permanent location within Spartanburg County. The Center offers them office and warehouse space, specialized training, technical support, market research, industry expert mentors, and cultural support for international companies. The Center is also located in a foreign trade zone, which allows companies to produce goods without the associated customs duties and related taxes. A.L. Industries, an Israeli company that manufactures automotive air filters, is developing their first U.S. manufacturing operations. Benore Logistics IT provides IT support for the Just-In-Time delivery for parts and supplies for BWM. Core Care Wellness is launching a new technology product that helps to ensure that Medicare patients receive annual wellness exams while also improving patient care and saving health care providers time and money. EchoStar is currently utilizing space to store equipment they will use to upgrade their operations. Edgewater Automation designs and builds custom automation equipment for assembly and test applications. Jeffreys Manufacturing has two show rooms in the Center for their OKK CNC machines and HAAS CNC Machines, which SCC students and instructors also use to train on. Motion Mekanix is a global leader in automation engineering that provides programming, consulting and training for a wide range of robots and applications. Trimite is using the Center’s warehouse space to store new equipment to up fit an expansion of their facility. Previous clients of the Center include Adidas, Amazon, BMW, Jankel Tactical Systems, Master Precision Global and Walmart, among others. For more information about the Center for Business and Entrepreneurial Development, please visit www.sccsc.edu/econdev or contact Mike Forrester at (864) 592-6204.